With his superb guitar work, blending both the retro and the contemporary, (think Otis Redding plays Robert Cray playing Stevie Ray Vaughan! ), Robbie King is considered by many in the music world to be the very essence of the modern classic bluesman. In this collection of rocking, soulful and inspired recordings you will hear the unmistakable influence of some of the greatest R&B and Blues artists of all time. Robbie's love for his craft and those who came before him is more than evident in his first solo effort, A Classic Case of the Blues . Born in Wichita Falls, Texas, RK grew up listening to and learning to admire artists like Ray Charles, Albert Collins and BB King. A desire to play that kind of music for appreciative fans became a powerful obsession and this boyhood dream of a Blues man's life has, after decades of hard work and dedication, indeed come true. 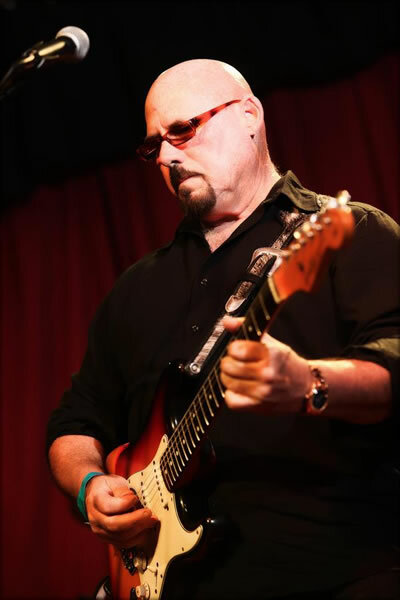 Robbie has had the privilege of sharing the stage with Bonnie Riatt, Johnny Neel (song writer and keyboard player for the Allman Brothers Band), and countless other stars illuminating the little Blue corner of the music universe! Although his sound is unmistakably Blues, Robbie approaches this uniquely American genre with a truly original treatment sure to please all Rock, Blues and R&B fans. Audiences that get the chance to experience his talents live, or hear his tracks on any recording session lucky enough to have him sitting in, know that the excitement surrounding Robbie King really is infectious! And now Robbie King's new CD, so well received by entertainment industry pros throughout North America, is ready to be enjoyed by blues lovers everywhere. But we must warn you..once you catch a Classic Case of the Blues, there is no cure!